Welcome everyone to The Grove a place of festivity and performance set in the leafy surrounds of central Castlemaine’s Victory Park. The Grove will explore the fertile intersections between art, food and sustainability, through a delicious program of regionally conceived imaginative performances and interactive activities distilled from months of dedicated artistic explorations and community workshops. Join us on this Festival Opening weekend as The Grove unfolds like a flower, revealing a place of edible and artistic riches that are just waiting to happen. Activities will include Dig for Victory Permaculture Design Workshops, Food Shrine creations, Seedball Sessions, Ephemeral Costume Making and more. The Opening Weekend also features an abundance of regional and market produce surrounding The Grove and the Castlemaine Farmers Market on Sunday 17 March. The Living Stage combines stage design, permaculture and community engagement to create a recyclable, biodegradable and edible performance space. Part theatre and part garden, The Living Stage features vertical garden walls, suspended pots and portable garden beds with edible plants. The Living Stage will house a series of experimental works that draw on the concept of regeneration, and interact with the unique design that surrounds them. The result will be part experiment and part food growing demonstration; inspiring our collective optimism about the future and a ‘how-to’ initiative that reveals what is actually possible in a world facing increasing global food crises. CreateAbility (Bendigo) along with Born in a Taxi and Justin Bull (undue noise) present an ambitious new work full of budding, shooting, blooming liveliness — out of the fruit bowl and into the fresh air. Set amongst the elements, taking cues from the living world around us, Produce grafts together sound and movement and a living, interactive theatrical space (The Living Stage). Playful and surreal, we witness growth, change, moments of unexpected generosity and the chaos of nature in this visual feast. Together we hope to find that restriction and growth are not opposites and in fact work creatively together. What do we value most and what do we want to take into the future? Can we keep what is precious to us and share it at the same time? Dig into these questions with berni m janssen, Alison Richards and their team around the preserves table. Bring your recipes, stories, images and ideas. Discover, exchange, share, make art. Join us in The Preserves Project to add your words, thoughts, drawings, stamps and stencils to the Big Tablecloth. 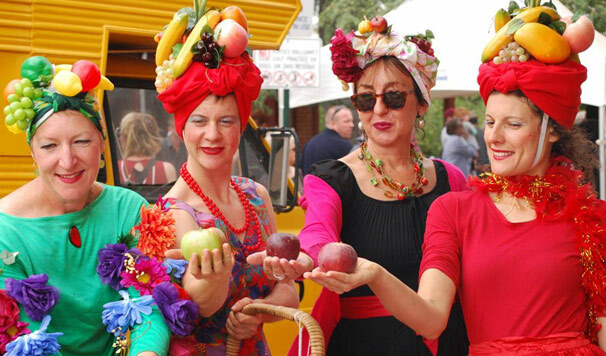 This our very own version of ‘Iron Chef’ meets ‘Naked Chef’, using produce from The Living Stage — two comic hosts and three hilarious judges will entertain as local chefs and food celebrities face-off for the 2012 Castlemaine State Festival Garden Chef title. Joined by the Carmen Mirandas and their entourage of little singing helpers from Castlemaine Primary School. Working with Eliza-Jane Gilchrist and Suzanne Kalk, Winters Flat Primary School students will create minds full of growth to decorate the park for The Grove weekend. Using food sourced only within 100 miles of Castlemaine, community harvest group Growing Abundance brings the Long Table Feast to The Grove. Join us in sharing this bounty of local produce and celebration community spirit. $10 for a delicious vegetarian meal. Imagine if Victory park were an edible playground, brimming with colourful, beautiful and edible delights! Here is your chance to dream up a public space full of your favourite fruits and vegetables. Come along and turn your imaginings into moveable, edible, ideas to inspire the passer by. Help us create a design for an edible Victory Park which will be presented to local council. Following the Festival we will actually work with local council to ‘dig for victory’ and grow some of our gastronomic dreamings in Victory Park! Dress ups with a difference. Out of the dress up box comes recycled paper and card and more to get your imagination fired up. Cut, fold, paste and colour your way into a whole new persona at the Ephemeral Costume Making Workshop. Have fun building it and wearing it and then recycle or compost your costume when you have finished! Great play for anyone who likes to dress up – suitable for adults and kids alike. The best of regional Central Victorian food produce available for your pleasure.